I would venture to guess that few if any music lovers would recognize the name Fartein Valen who was even a somewhat obscure composer in his native Norway, achieving some national recognition only in the last decade of his life. Although Valen studied with Max Bruch in Berlin, his music, typified by its dissonant polyphony, more closely resembles that of the new Viennese School masters like Berg, Schoenberg and Webern. Like his European contemporaries, Valen found his compositional voice through post-romanticism as heard in the two completed movements of his 1909 String Quartet Op. 0. The remainder of this program are works from the late 1920’s and early 1930’s, the String Quartets Nos. 1 and 2, and three songs for soprano based on texts by Goethe. The Hansa Quartet who have been the long-standing champions of Valen’s chamber works are violinists Asta Jorgensen and Hilary Foster, violist Helga Steen and cellist Walter Heim. The quartet accompanies soprano Hilde Haraldsen Sveen in the Goethe song cycle. Both dts HD Master Audio 5.1 and 2.0 LPCM 192kHz/24-bit versions originate from a new hi-def standard, having been recorded on 352.8kHz/24-bit DXD masters. Both soundtracks are excellent but those interested in the ambience of the Storveit Church in Bergen will opt for the former. There is a booklet of very informative liner notes that give us the scoop on this relatively unknown composer and works performed. In addition, we get a hybrid SACD, and the mShuttle function that offers access to MP3 and FLAC versions for listening on computers. I wonder , on occasion, why some composers rise to the top of the musical heap and others languish in relative obscurity. In the case of Fartein Valen, his musical language might have been on the leading edge in 1920’s Norway but, taken as a whole, it lacks the immediacy and potency of Schoenberg or of other members of the Central European dissonant school. The early 20th century composers who moved away from traditional chromaticism produced music that might have shocked the listeners of their day but, in the fullness of time and with a succession of modernist composers, such shockwaves have largely subsided. Considering the present program, one wishes that Valen had rubbed shoulder more often with his fellow composers. His retreat to the Norwegian countryside probably prevented his getting stimulated by the vibrant musical life going on outside of his own country. 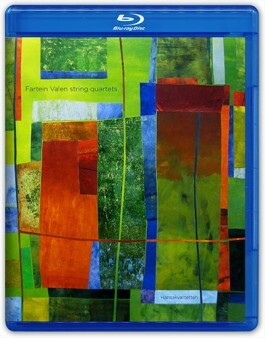 As it is, we get some Valen chamber works enthusiastically performed a group of true believers with abundant skill and supported by an excellent recording. Whether listeners will regard this disc as a testimony to what might have been or simply enjoy it as it is will depend on whether they willingly suspend their critical faculties, a luxury not typically permitted to reviewers.